Hamburgs have a wild disposition. They like to fly, forage, and roost in trees. Owners have awoken to find their whole flock in the trees. Humans easily spook the Hamburg chicken. Given these traits, they have little toleration for confinement. They enjoy free-range freedom and free-range food in the form of grain. Like most foragers that survive, Hamburgs develop a keen awareness of their environment. 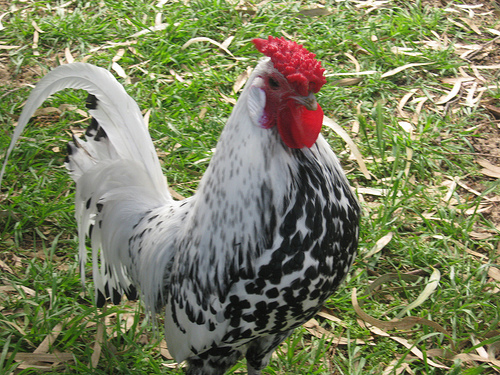 Hamburg chickens have ten different plumages: Silver-Spangled, Golden-Spangled, Golden-Penciled, Silver-Penciled, White, Black and Citron Spangled. Although small to start with, Hamburgs have both a standard and bantam size. The standards average four to five pounds while the bantams top out at one and half. Hamburgs sport red rose combs, medium matching wattles, and white earlobes. Their unique horn colored beak has gray shanks. Unlike most chickens Hamburgs wear pink soles on the bottom of their feet. Butchered Hamburgs display a white meat on dark colored bones.